BBC Children in Need (also promoted as Plant Mewn Angen in Wales) is the BBC's UK charity. Since 1980 it has raised over £1 billion  for disadvantaged children and young people in the UK. One of the highlights is an annual telethon, held in November and televised on BBC One and BBC Two from 7:30 pm until 2:30 am. "Pudsey Bear" is BBC Children in Need's mascot, whilst Sir Terry Wogan was its long-standing host for 35 years. A prominent annual event in British culture, Children in Need is one of three high profile British telethons. It is the only charity belonging to the BBC, the other telethons being Red Nose Day and Sport Relief, both supporting Comic Relief. The BBC's first broadcast charity appeal took place in 1927, in the form of a five-minute radio broadcast on Christmas Day. It raised about £1,342, which equates to about £69,950 by today's standards, and was donated to four children's charities. The first televised appeal took place in 1955 and was called the Children's Hour Christmas Appeal, with the yellow glove puppet Sooty Bear and Harry Corbett fronting it. The Christmas Day Appeals continued on TV and radio until 1979. During that time a total of £625,836 was raised. Terry Wogan first appeared during this five-minute appeal in 1978, and again in 1979. Sometimes cartoon characters such as Peter Pan and Tom and Jerry were used. In 1980, the first Children in Need telethon was broadcast. It was a series of short segments linking the evening's programming instead of the usual continuity. It was devoted to raising money exclusively destined for charities working with children in the United Kingdom. The new format, presented by Terry Wogan, Sue Lawley and Esther Rantzen, saw a dramatic increase in public donations: £1 million was raised that year. The format was developed throughout the 1980s to the point where the telethon segments grew longer and the regular programming diminished, eventually being dropped altogether from 1984 in favour of a single continuous programme. This format has grown in scope to incorporate further events broadcast on radio and online. As a regular presenter, Wogan had become firmly associated with the annual event, continuing to front it until 2014. This was because in the following year, he started to battle ill health from which he died in 2016. An award called the Sir Terry Wogan Fundraiser of the Year has been presented since 2016 to someone who has gone above and beyond to help raise money for Children in Need. The award was set up by Terry's family and was presented by Terry's son, Mark, at the 2016 telethon in memory of the late Sir Terry Wogan. Joanna Lumley awarded it to Ellie and Abbie Holloway during the 2017 telethon. The telethon features performances from many top singers and groups, with many celebrities also appearing on the 6 1/2 hour long programme performing various activities such as sketches or musical numbers. Featured celebrities often include those from programmes on rival network ITV, including some appearing in-character, and/or from the sets of their own programmes. A performance by BBC newsreaders became an annual fixture. Stars of newly opened West End musicals regularly perform a number from their show later in the evening after "curtain call" in their respective theatres big bombs. The BBC devotes the entire night's programming on its flagship channel BBC One to the Children in Need telethon, with the exception of 35 minutes at 10 o'clock while BBC News at Ten, Weather and Regional News airs, and activity continues on BBC Two with special programming, such as Mastermind Children in Need, which is a form of Celebrity Mastermind, with four celebrities answering questions on a chosen subject and on general knowledge. In recent years, before the telethon itself, the BBC has broadcast Children in Need specials including DIY SOS The Big Build, Bargain Hunt, The One Show, in which hosts Matt Baker and Alex Jones did a rickshaw challenge and a celebrity version of Pointless in which Pudsey assists hosts Alexander Armstrong and Richard Osman. Unlike the other BBC charity telethon Comic Relief, Children in Need relies a lot on the BBC regions for input into the telethon night. The BBC English regions all have around 5–8-minute round-ups every hour during the telethon. This does not interrupt the schedule of items shown from BBC Television Centre as the presenters usually hand over to the regions, giving those in the main network studio a short break. However BBC Scotland, BBC Wales and BBC Northern Ireland opted out of the network schedule with a lot of local fundraising news and activities from their broadcast area. Usually they went over to the network broadcast at various times of the night, and usually they showed some network items later than when the English regions saw them. This was to give the BBC nations of Scotland, Wales and Northern Ireland a much larger slot than the BBC English regions because the "nations" comprise a distinct audience of the BBC. Usually BBC Scotland, Wales and Northern Ireland handed back to network coverage from around 1:00 am on the telethon night. For the 2010 appeal this changed, with Northern Ireland, Scotland and Wales deciding not to have their usual opt-outs and instead following the English regions' pattern of having updates every hour. The mascot which fronts the Children in Need appeal is called Pudsey Bear. He was created and named in 1985 by BBC graphic designer Joanna Lane, who worked in the BBC's design department. Asked to revamp the logo, with a brief to improve the charity's image, Lane said "It was like a lightbulb moment for me, We were bouncing ideas off each other and I latched on to this idea of a teddy bear. I immediately realised there was a huge potential for a mascot beyond the 2D logo". The bear was named after her hometown of Pudsey, West Yorkshire, where her grandfather was mayor. A reproduction of the bear mascot (made of vegetation) is in Pudsey park, near the town centre. Originally introduced for the 1985 appeal, Pudsey Bear was created as a triangular shaped logo, depicting a yellow-orange teddy bear with a red bandana tied over one eye. The bandana had a pattern of small black triangles. The mouth of the bear depicted a sad expression. The lettering "BBC" appeared as 3 circular black buttons running vertically down the front of the bear, one capital letter on each, in white. Perpendicular to the buttons, the words "children-in-need" appeared in all lower case letters along the base of the triangular outline. Accessibility for young readers, and people with disabilities including speech and reading challenges, were factors weighed by the designer Joanna Ball, specifically the "P" sound in "Pudsey" name, and the choice of all lower case sans serif letters for the logotype. In 1986, the logo was redesigned. Whilst retaining the concept of a teddy bear with a bandana over one eye, all other elements were changed. Specifically, the triangular elements of the underlying design were abandoned, as well as the corporate identity colour scheme was changed. 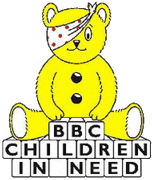 The new bandana design was white with red spots, one of the buttons was removed and the logotype now appeared as building blocks, which spelled out "BBC CHILDREN IN NEED" in capital letters. Pudsey now has a smiling expression on his face rather than a sad one like the previous logo. In 2007, Pudsey and the logo were redesigned again. This time, Pudsey's bandana had multicoloured spots, and all of the buttons were removed. By 2009, Pudsey had been joined by another bear, a brown female bear named "Blush". She has a spotty bow with the pattern similar to Pudsey's bandana pattern. In 2013, Moshi Monsters introduced Pudsey as an in-game item for 100 Rox. The Children in Need 2015 campaign on 13 November 2015 marked the thirtieth birthday of Pudsey Bear, who has been the charity's mascot since 1985. ^1 The Collective includes Gary Barlow, Tulisa Contostavlos, Wretch 32, Ed Sheeran, Ms. Dynamite, Chipmunk, Mz Bratt, Dot Rotten, Labrinth, Rizzle Kicks and Tinchy Stryder. In November 2006, Intelligent Giving published an article about Children in Need, which attracted wide attention across the British media. The article, titled "Four things wrong with Pudsey", described donations to Children in Need as a "lazy and inefficient way of giving" and pointed out that, as a grant-giving charity, Children in Need would use donations to pay two sets of administration costs. It also described the quality of some of its public reporting as "shambolic". In 2007, it was reported that presenter Terry Wogan had been receiving an annual honorarium since 1980 (amounting to £9,065 in 2005). This made him the only celebrity paid for his participation in Children in Need. According to Wogan's account, that he would "quite happily do it for nothing" and had "never asked for a fee". The BBC stated that the amount, which was paid from BBC resources rather than from the Children in Need charity fund, had "never been negotiated", having instead increased in line with inflation. Two days before the 2007 event, it was reported that Wogan had waived his compensation. There has been concern about the type of groups receiving funding from Children in Need. Writing in The Spectator, Ross Clark noted that funding goes towards controversial groups such as Women in Prison, which campaigns against jailing female criminals. Another charity highlighted was the Children's Legal Centre, which provided funding for Shabina Begum to sue her school as she wanted to wear the jilbāb. Clark pondered whether donors seeing cancer victims on screen would appreciate "that a slice of their donation would be going into the pockets of Cherie Blair to help a teenage girl sue her school over her refusal to wear a school uniform". A former BBC governor has revealed that Jimmy Savile was kept away from Children In Need in recent years though he was on the show in earlier years. Sir Roger Jones who was also chairman of the charity says he had suspicions about Jimmy Savile a decade ago before the news of Jimmy Savile's sexual abuse scandal came to public light in 2012. His comments came on the day an inquiry into whether the British Broadcasting Corporation's child protection and whistle-blowing policies are acceptable began. ^ "BBC – Nations – Wales – Elusennau". Retrieved 3 November 2014. ^ "BBC Children in Need - Frequently Asked Questions (FAQ)". BBC. Retrieved 8 June 2018. ^ "BBC - Star-studded presenter line-up announced for BBC Children in Need 2017 - Media Centre". bbc.co.uk. Retrieved 14 March 2018. ^ a b c d "Our History". BBC. Archived from the original on 25 October 2009. Retrieved 17 November 2014. ^ BBC Children in Need (30 June 2012). "BBC Children in Need Annual Report and Accounts Nine Months to 30 June 2012" (PDF). Charity Commission for England and Wales. p. 4. Retrieved 16 November 2014. ^ a b c d "BBC Annual Report & Accounts 1987-88" (PDF). BBC. p. 21. Retrieved 28 May 2015. ^ a b "BBC Annual Report & Accounts 1987-88" (PDF). BBC. p. 39. Retrieved 28 May 2015. ^ a b "Lou Reed and Pudsey aim to raise £20m". news.bbc.co.uk. 21 November 1997. Retrieved 14 November 2014. ^ "Pudsey bear says a big thank you". BBC News. 23 May 1998. ^ "Children in Need November 1998". fundraising.co.uk. 23 November 1998. Archived from the original on 29 October 2013. Retrieved 16 November 2014. ^ "Entertainment Stars come out for Children In Need". BBC. 20 November 1998. Retrieved 3 November 2014. ^ "Children in Need appeal passes £11m". BBC. 21 November 1998. Retrieved 16 November 2014. ^ "TV appeal hits record total". BBC. 27 November 1999. Retrieved 16 November 2014. ^ "BBC Children In Need Appeal 2000". BBC. Archived from the original on 18 December 2000. Retrieved 17 November 2014. ^ Deans, Jason (20 November 2000). "Cilla beats Ant and Dec in TV ratings". The Guardian. The Guardian. Retrieved 16 November 2014. ^ "Children In Need raises millions". BBC. 17 November 2001. Retrieved 17 November 2014. ^ "Children In Need breaks record". BBC. 30 April 2002. Retrieved 16 November 2016. ^ "Record total for Children In Need". news.bbc.co.uk. 16 November 2002. Retrieved 14 November 2014. ^ "How much money did BBC Children in Need raise last year?". BBC. Archived from the original on 15 April 2004. Retrieved 17 November 2014. ^ "Westlife boost Children in Need". BBC. 22 November 2003. Retrieved 16 November 2014. ^ "How much money did BBC Children in Need raise last year?". BBC. 19 July 2012. Archived from the original on 15 January 2005. Retrieved 17 November 2014. ^ "£17,156,175 raised by BBC Children in Need so far". BBC. 20 November 2004. Retrieved 16 November 2014. ^ "Children in Need total tops £18m". BBC. 18 November 2006. Retrieved 16 November 2014. ^ "£17m raised by BBC Children in Need so far". BBC. 19 November 2005. Retrieved 16 November 2014. ^ "How much money did BBC Children in Need 2006 raise?". BBC. 19 July 2012. Archived from the original on 3 September 2007. Retrieved 17 November 2014. ^ "Latest News". BBC. Archived from the original on 15 December 2007. Retrieved 17 November 2014. ^ "Who You've Helped 2008". BBC. Archived from the original on 9 February 2009. Retrieved 17 November 2014. ^ a b "Record £26m for Children in Need". BBC News. BBC. 19 November 2011. Retrieved 16 November 2014. ^ "Annual Report and Accounts Nine Months to 30 June 2012" (PDF). The BBC Children in Need Appeal. Retrieved 22 July 2013. ^ "Children in Need peaks with 12m" (PDF). broadcastnow.co.uk. 21 November 2011. Retrieved 17 November 2014. ^ "BBC Children in Need 2012 reaches highest total ever of £26,757,446". BBC. 17 November 2012. Retrieved 16 November 2014. ^ a b Ricketts, Andy (3 July 2014). "BBC Children in Need raised a record £49.6m last year". www.thirdsector.co.uk. Retrieved 14 November 2014. ^ "BBC Children in Need Appeal 2013 raises the highest total ever, £31.1million!". BBC. 16 November 2013. Retrieved 16 November 2014. ^ "BBC Children in Need Appeal 2014 raises the highest total ever, £32.6 Million". BBC.co.uk. Retrieved 15 November 2014. ^ Carson, Sarah (14 November 2015). "Children in Need 2015: 'Record-breaking' 37m raised as fundraising continues". The Daily Telegraph. Retrieved 14 November 2015. ^ Silverstein, Adam (14 November 2015). "Children in Need's 2015 total is a record-breaking £37,100,687 million". Digital Spy. Retrieved 14 November 2015. ^ "BBC Children in Need announces highest ever fundraising total: £55million". BBC Media Centre. 6 July 2016. Retrieved 7 July 2016. ^ "BBC - BBC Children in Need announces highest ever fundraising total: £60 million - Media Centre". bbc.co.uk. Retrieved 14 March 2018. ^ "BBC - BBC Children in Need announces 2017 fundraising total: £60.7 million - Media Centre". www.bbc.co.uk. Retrieved 15 November 2018. ^ "Mel Giedroyc joins the Children in Need presenting team". radiotimes.com. Retrieved 14 March 2018. ^ "BBC Children in Need Rocks 2018". BBC. Retrieved 3 October 2018. ^ a b Potts, Lauren (14 November 2014). "Children in Need: Pudsey Bear's path from mascot to national treasure". BBC News. Retrieved 14 November 2014. ^ "Official Charts Company". officialcharts.com. Retrieved 8 November 2017. ^ "o'-my-father-had-a-rabbit | full Official Chart History | Official Charts Company". Retrieved 8 November 2017. ^ "bog-eyed-jog | full Official Chart History | Official Charts Company". Retrieved 8 November 2017. ^ "Digitalspy.co.uk". Digital Spy. 30 October 2008. Retrieved 3 November 2014. ^ "BBC Blogs - BBC Children in Need". bbc.co.uk. ^ a b "It's Gary Barlow & The Collective". The Sun. London. ^ "X Factor judges to record Children in Need charity song". BBC.co.uk. 25 August 2011. 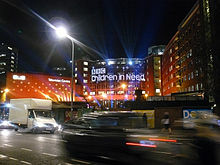 ^ "BBC – Media Centre – BBC Children in Need 2012 – the stars of Appeal Night revealed". Retrieved 3 November 2014. ^ "BBC – Media Centre – BBC Ellie Goulding releases official single for BBC Children in Need". Retrieved 3 November 2014. ^ "BBC - BBC Children in Need - Gareth Malone forms an all-star choir for the Official BBC Children in Need single". BBC. Retrieved 3 November 2014. ^ "Jess Glynne sings Children In Need single". BBC News. BBC. 3 November 2015. Retrieved 3 November 2015. ^ "Jess Glynne's Take Me Home to lead BBC Children In Need campaign". Belfasttelegraph.co.uk. Belfast Telegraph. 3 November 2015. Retrieved 3 November 2015. ^ "Craig David's "All We Needed" is the official BBC Children in Need single". Children in Need. BBC. Retrieved 18 November 2016. ^ Need, BBC Children in. "We're delighted to announce @katiemelua is to release the official #CiN 2017 single, 'Fields of Gold'". twitter.com. Retrieved 14 March 2018. ^ "BBC - Jamie Cullum to release BBC Children in Need's official single for 2018 - Media Centre". www.bbc.co.uk. Retrieved 3 November 2018. ^ Kelly, Annie (28 November 2006). "Pudsey's worst nightmare". The Guardian. London. Retrieved 28 April 2010. ^ "Dailymail.co.uk". Mail Online. Retrieved 3 November 2014. ^ "Wogan charity fee defended by BBC". BBC. 4 March 2007. Retrieved 2 June 2007. ^ "Terry Wogan waives his £9,000 fee for Children in Need". Daily Mail. London. 15 November 2007. Retrieved 19 November 2011. ^ Clark, Ross (24 March 2007). "Read the small print before the next Comic Relief". The Spectator. p. 16. Retrieved 17 December 2013. ^ "Savile inquiry begins as Children In Need ban is revealed". BBC News. 29 October 2012. Retrieved 27 March 2019.